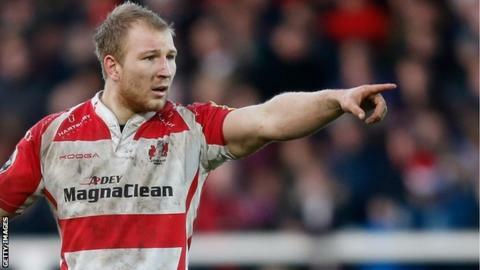 Gloucester cemented their spot at the top of pool five in the European Rugby Challenge Cup with victory at Oyonnax. Scotland scrum-half Greg Laidlaw and Riaan Smit kicked three penalties each to leave the scores level at the break. Matt Kvesic scored the only try of the match after the interval, going over for a brilliant individual effort. Penalties from Smit and Regis Lespinas kept the French side in touch, but three more Laidlaw kicks took his tally to 22 points and sealed the result. Gloucester had run in six tries as they swept aside Brive at Kingsholm in their opening European fixture last week, but their match at Stade Charles-Mathon was a much cagier affair, with Laidlaw and Smit exchanging penalties for a half-time score of 9-9. Three more points came from the boot of Smit shortly after the interval, but England flanker Kvesic, fresh from signing a new contract during the week, put the Cherry and Whites ahead with a fine solo score, breaking a couple of tackles after good defensive work by Charlie Sharples. Laidlaw again converted, before Lespinas notched a further penalty to reduce the deficit to one point. But Laidlaw's accuracy from the tee would prove the difference between the teams, kicking three more penalties in the final 20 minutes to wrap up victory for David Humphreys' side. Oyonnax: R. Smit, Tian, Aguillon, Hansell-Pune, Luatua, Lespinas, Cibray, Tonga'uiha, Jenneker, Clerc, Nemecek, Ursache, Bernad, Andre, Wannenburg. Replacements: Jullien, Tichit, Guillamon, Sobela, Domenech, Codjo, Paea, Power. Gloucester: Cook; Sharples, Purdy, Twelvetrees (capt), May; Hook, Laidlaw; Wood, Hibbard, Afoa; Savage, Hudson; Kalamafoni, Kvesic, Morgan. Replacements: Dawidiuk, Thomas, Puafisi, Stooke, Moriarty, Robson, Meakes, Burns.